Based on the most recent speculation about the upcoming iPhone 8 (or whatever Apple names it), it sounds like the Touch ID and Home button is going to be banished from the front of the device, possibly ending up around the back instead. 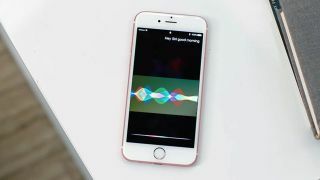 That would mean one less way of launching Siri - Apple's digital assistant can be invoked with a long press on the Home button in the current iPhones, which is handy if you don't want to shout out a "hey Siri!" voice command to launch it, for whatever reason. Now noted Apple tipster Guilherme Rambo says he's seen source code that the iPhone 8 will allow users to launch Siri with a long press on the Sleep/Wake button instead of the Home button, so you'll still have a way of opening the assistant with a button press. It wasn't immediately clear where Rambo had found the information but he has come to prominence for digging out nuggets of information from the firmware for Apple's HomePod speaker, including references to a 4K Apple TV and facial recognition in the iPhone 8 (which may help ease the pain of a repositioned Touch ID button). There has been a small ripple of speculation that Touch ID could be built into the same Sleep/Wake button as well, which would make the button on the side of your upcoming iPhone device an all-powerful way of unlocking your phone and calling up Siri as well. The iOS 11 software being pushed out to the masses next month features a new Type to Siri feature where you can type rather than speak out your queries - handy for those times you're in the library or in a loud nightclub - and so an option for starting Siri without a voice command would make sense too.